A cookie crumb crust is topped with layers of dense chocolate and pudding in this make-ahead dessert. Each chocolate layer is better than the last! Combine baking crumbs and margarine in 8-inch square pan. Press firmly onto bottom and 1 inch up sides of pan; set aside. Mix chocolate and condensed milk until well blended; pour into crust. Sprinkle with pecans; set aside. Pour 2 cups milk into large bowl. Add dry pudding mixes. Beat with wire whisk 2 min. or until well blended. (Mixture will be thick.) Spoon 1-1/2 cups of the pudding over pecans in crust. Add 1 cup of the whipped topping to remaining pudding; stir with wire whisk until well blended. Spread over pudding layer in crust; top with the remaining 1 cup whipped topping. Refrigerate at least 3 hours. Store leftovers in refrigerator. Savour a serving of this indulgent special-occasion dessert. 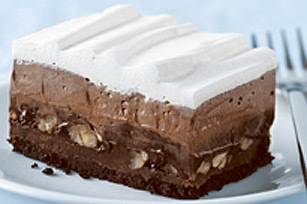 Since it serves 12, it makes a great dessert for your next party. Preheat oven to 350°F. Spread pecans in single layer in shallow baking pan. Bake 5 to 7 min. or until lightly toasted, stirring occasionally. Store leftover sweetened condensed milk in tightly covered container in refrigerator up to 1 week. Add to coffee, tea, oatmeal or fruit.